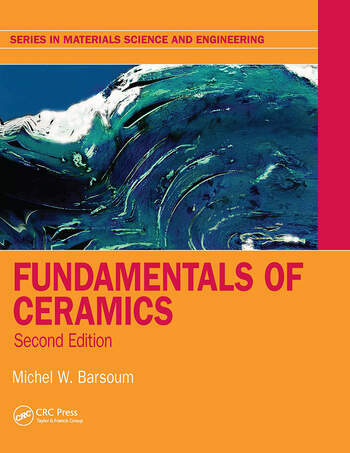 Fundamentals of Ceramics presents readers with an exceptionally clear and comprehensive introduction to ceramic science. This Second Edition updates problems and adds more worked examples, as well as adding new chapter sections on Computational Materials Science and Case Studies. The Computational Materials Science sections describe how today density functional theory and molecular dynamics calculations can shed valuable light on properties, especially ones that are not easy to measure or visualize otherwise such as surface energies, elastic constants, point defect energies, phonon modes, etc. The Case Studies sections focus more on applications, such as solid oxide fuel cells, optical fibers, alumina forming materials, ultra-strong and thin glasses, glass-ceramics, strong and tough ceramics, fiber-reinforced ceramic matrix composites, thermal barrier coatings, the space shuttle tiles, electrochemical impedance spectroscopy, two-dimensional solids, field-assisted and microwave sintering, colossal magnetoresistance, among others. Prof. Michel W. Barsoum is Distinguished Professor in the Department of Materials Science and Engineering at Drexel University. He is an internationally recognized leader in the area of MAX phases and the 2D solids labeled MXenes. Most recently he also discovered a new mechanism – ripplocations - in the deformation of layered solids. With > 450 refereed publications and an ISI h index of > 80, his work has been highly and widely cited. He is an International Fellow of the Royal Swedish Academy of Engineering Sciences, Fellow of the American Ceramic Soc. and the World Academy of Ceramics. He is the author of the book, MAX Phases: Properties of Machinable Carbides and Nitrides. In 2000 he was awarded a Humboldt-Max Planck Research Award for Senior US Research Scientists. He has been a visiting professor at Linkoping University in Sweden since 2008. In 2017, he was a recipient of a Chair of Excellence from the Nanosciences Foundation in Grenoble.